Wouldn't you like to have dinner with a wonderful Portuguese? Last night some new friends and I dined with Oscar - which is a wine (technically two - a white and a red) but also a member of the Quevedo wine family. I met Oscar Quevedo Jr. in 2009 at the European Wine Bloggers Conference in Lisbon, and he still writes his family's winery blog. He is a prime example of how wineries can benefit from a likable brand ambassador who is adept at social media - and an all-around nice guy. Along with his winemaker sister, Claudia, Oscar is one of the more youthful members of a family that has made wine in the Douro Valley for generations. Quevedo's extensive line up of Ports includes lovely ruby, tawny, white, rose, and vintage ports. 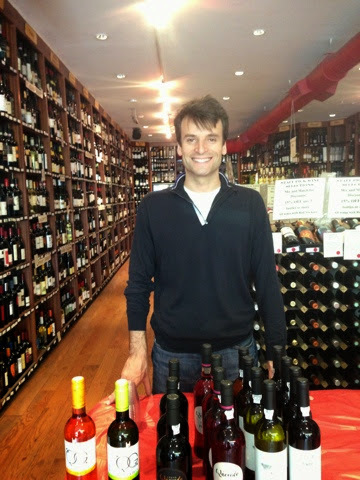 Yesterday Oscar was at Columbia Wine Company - which boasts quality wine from around the globe - located way uptown at 170th and Broadway in Washington Heights. The store was hosting a tasting with over a dozen bottles from Portugal, South Africa, and more. Those who know me well know I adore Port, and I did buy both Quevedo tawny and rose Ports straight off the tasting table. However, I'm often more excited about the Douro's dry wines, because most people are unaware of them. So I was eager to present these wines, made from blends of native Portuguese grapes, at last evening's intimate dinner party. Oscar white was from 2012, and it was a medium bodied white wine with a nose of green apple. It had refreshing acidity and crisp, bright fruit flavors. It was a perfect pairing with crab cakes served on arugula with hazelnut oil and a roasted red pepper coulis. The red wines of the Douro are dense, with full-on black fruit and plenty of tannins to stand up to fatty dishes like lamb or steak. As the sociable evening continued, my friend pulled the cork on the red Oscar and we sipped it with hard cheeses, including a buttery cheddar reserve. It was a wonderful way to end the evening - which, had we decided to stay up even later, would have eventually led to that bottle of Tawny. But my recently-purchased Quevedo Ports will have to wait for another magical evening of wine, food, and friendship. 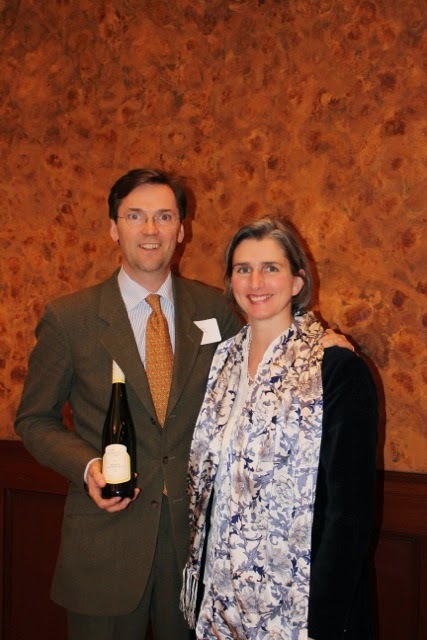 The distinguished wines of Tokaj, Hungary, were the focus of an elegant lunch held at the Hungarian Consulate. The event was hosted by Ambassador Karoly Dan, Consul General of Hungary to New York and attended by Katinka Kekessy Wimpffen and Arno Wimpffen, the owners of Patricius Winery, as well as guests and media. Very few oenophiles know that Tokaj is among the world’s oldest designated wine regions. The five luncheon wines, all created from native Hungarian grapes, reflected this distinctive heritage. The afternoon included an open forum for discussion about the history and future of the Tokaj region. After the economic downturn of the communist era, the region is now seeing a rebirth. There is new energy being brought from families like Katinka’s. She returned to the home of her forefathers to renew the vineyards and start over with her own family in this historic land. The afternoon began with a light-bodied white, the Harslevelu 2012 – the Hungarian word for “linden leaf,” which offered pretty floral nose with vanilla notes. Their dry Furmint was a fresh white wine with high acid, a good choice for many dishes and a wonderful alternative to the ubiquitous Chardonnay. The two varietal wines are also the component wines in the famous Tokaji Aszu. We were also treated to the Katinka late harvest, a delicate, sweet wine with a wonderful balance of acidity and sugar. The afternoon ended with the wine that made the area famous – the 2003 Tokaji Aszu 5 Puttonyos, Gold medal International Wine Challenge winner at London in 2013. This rich, sweet wine is made with a portion of grapes that have been affected by noble rot--in the same way that Sauternes is in France--and it was sipped with the reverence it deserved.